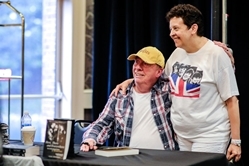 SHAPING SOUND: Beatles sound engineer recalls memories of band . Beatles Radio: The Beatles, Solos, Covers, Birthdays, News The Fab 4 and More! Never has there been — nor will there ever be — another first week on the job quite like the one Geoff Emerick had nearly 56 years ago. The year was 1962. The location was EMI Records at Abbey Road in London. Emerick was only 15. An innovative young lad with a love of music since the age of 7, he had stepped out in faith and interviewed for a sound engineering job at the famous studio. His Dad went along with him on that interview. He wasn’t confident he had made an impression. But, to his delight, Emerick received a call back from the studio and was hired as an assistant engineer. Hard to top that lucky break. But, fate still had a little more in store for Emerick. On his second day of work, the self-described “button pusher” had the opportunity to sit in on the first EMI recording session of a promising band from Liverpool. They were called The Beatles.